We bring forth our vast industrial experience and expertise in this business, instrumental in providing Rubber Letter Set. Vilax interchangeable Rubber Lock type, is available in a variety of styles & Size to fit most Grooved base Coders and Marking machines. We bring forth a unique range of Grooved Rubber Letter Set with 39 mm size at affordable prices. Manufactured using high grade raw material, these specialized Rubber Letter Set are customized as per the specification of our clients. We are a top notch supplier of Rubber Letters. We are a top-notch organization, engaged in providing Rubber Letters. We offer Rubber Letters to our clients. 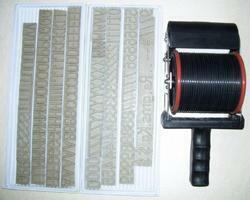 Our company is considered as a specialist in offering a wide collection of rubber alphabets. We offer the most innovative range of products, which are very popular in the market. From our wide consignment, we are affianced in supplying Rubber Letters. In order to meet excellent quality standards, we are supplying Rubber Letters. We are amongst the most reputed names in the industry, offering Rubber Letters. 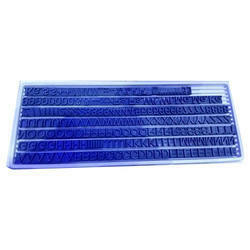 Banking on our enriched industry experience, we are able to supply Grooved Rubber Letter Set.